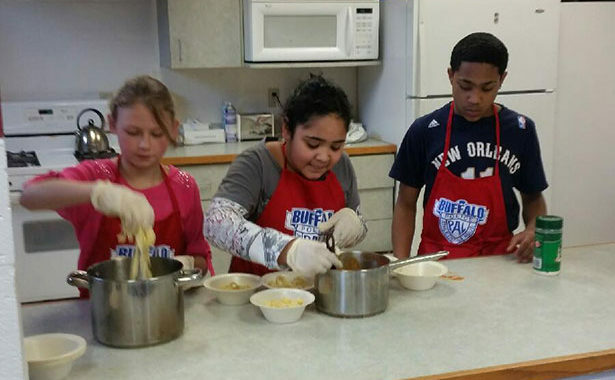 Culinary Arts - Police Athletic League of Buffalo, Inc.
Buffalo Pal in partnership with F Bites (www.fbites.webstarts.com) and Aunt Connie’s Ed-U-Kitchen (www.auntconnieseduk.com) uses culinary instruction as a vehicle to develop leadership, professional skills, as well as college and career readiness in youth to empower a community that is responsive to the workforce development needs and opportunities of the Buffalo Niagara Region. The curriculum provides participants with an engaging, enjoyable classes in sheltered learning environment that promotes increased awareness, skills and confidence in making healthy food choices. See photos from recent culinary classes!